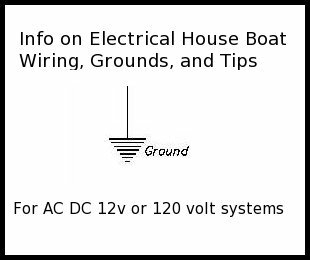 Marine electrical, ground info for houseboats. 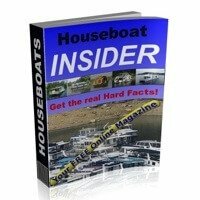 Any houseboat tips or information for grounding marine electrical systems? When wiring houses, etc. we drive a copper rod into the ground for the grounding (bare copper wire) of the system. 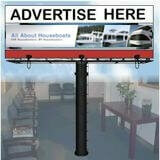 I know there a some major differences when it comes to wiring a house, and wiring a houseboat. But how do you ground an electrical system on a houseboat? Thanks for any info, Joe. Well Joe, that's a good question since there are some important differences when it comes to wiring a house, and wiring a houseboat. You will find that in the majority of boats, they use a common grounding buss bar to ground the 12 and 120 volts systems. What this means is that when you're connect to shore power, you're using the city supplied power lines to provide ground continuity. When you're disconnected from the shore power, you're using the common ground bus bar which is eventually leading to the water ground, and this is commonly connected through your drivetrain or underwater hardware. If you're looking to go a little deeper on marine electrical systems, have a look at the Marine Electrical Checklist, it has a lot of great information and answers to popular electrical questions. Lastly, hopefully some of our readers will share and post comments about their marine electrical houseboat tips and experiences. Feel free to use the "Click here to post comments." link found near the bottom of this page. 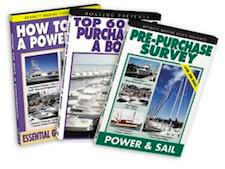 The bible for marine electrics and all marine systems is Nigel Calder's "Boatowner's Mechanical and Electrical Manual" from McGraw-Hill. This book is a bargain at twice the price. We bought a bank repo Mastercraft 34' a few years ago. No manual, no wiring diagram, marine head was in the bank guys office! After much frustration, I found Calder's book. Have replaced all the existing Romex with stranded marine wire, and installed proper shore-power breakers, ground networks, distribution panels, etc. The wiring even looks great. I no longer have that nagging worry (know what I mean?). I know the boat is wired to ABYC standards. Get the book. It is very compelling reading. A good electrical resource for me has been Home Power Magazine. It has articles on DC wiring, batteries, PV Panels, inverters etc. Lots of advertisements for the same. 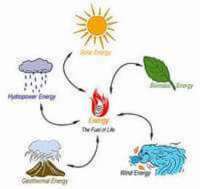 There is also info on wind, hydro and hot water systems. I used 12awg solid ROMEX for my DC circuits with the white carrying the power and the black the negative. Did not use the bare ground wire. I ran lots of circuits with minimal loads. I did this wiring when copper was extremely high and even Romex cost a bundle. It is down a bit now. I used Blue Sea Fuse blocks for the circuit protection... I think I have (2) with six circuits each. But, I recently learned that Square D QO breakers and load centers are rated for 12, 24 up to 48 VDC. I would consider using them as they are relatively inexpensive and readily available at most home center stores. Some might argue this and I liked to hear more pros and cons. You need to be careful if you are running 110VAC with the same type wire because the white wire is the neutral and the black carries the power or just about the opposite of a DC system. I tagged the wire with the proper designation and used colored electrical tape as another means of identifying the different systems. But marine grade wire is tinned, stranded, more flexible and properly color coded. The advantage of using the house wire for the DC is one can easily convert those systems to AC. 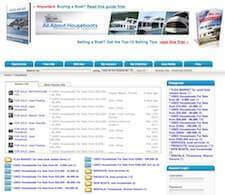 I found a great resource with reasonable prices and good service. I bought 4/0 marine wire and connectors for my inverter/charger to battery bank connection. I found a good resource when I wrote Micheal Kasten. For my grounding question he suggested a couple articles, one is called the Guide to Marine Metals, and the other is called Corrosion, Zincs and Bonding. For my situation I am following his advice.... "The question of grounding is not answered "yes" or "no" for SHORE POWER (which I do not have) but there is enough info presented so you can form your own opinion. The question of BONDING however is different, and a few definitive answers are given, especially as relates to a wooden hull (or floats)." Further he states... "Basically if you are not plugged into the grid, I don't see much reason to introduce grounding to the water or to the shore. If you are into radio like VHF or SSB or Ham, then you might consider a way to achieve an effective counterpoise - but that's as far as I'd take it. If you are safe with your occasional generator usage and have mitigated local shock hazards, you are probably good to go as is, i.e. without grounding." He also stated, and this really got my attention..."However if there happens to be an AC hot wire fault and you have grounded the generator's AC neutral bus, it is worth noting that you may actually INCREASE the shock hazard to anyone who happens to be in the water nearby (potentially fatal)...!" 1980 Jamestowner, When I bought the houseboat it had no electricity in it at all, just a 12 volt circuit, for lighting, I since then have completely wired the boat, added a marine generator, and it worked fine. But I have learned by reading your comments that I have got it wired wrong, I wired it just like a home, in which, I have all the neutral (whites) connected to the Ground wires, in the panels boxes. I have two small panel boxes and both have their separate feeds coming in from shore power, both the panel boxes are sharing the same ground wire though, which also makes them sharing the same neutral wires also!! So I need to get this wire correctly!! I have took the leads from the genset , connected each them to the panel at the same point where the shore power leads are in the panel box, then I put a disconnect back at the genset, so the flow of electricity will be stopped by the breaker and cannot get to the genset. So in other words, when I am on shore power, I have the breaker in the back to the off position, but when I get ready to go on the genset power, first I unhook shore power, and then flip , my breaker, up and it feeds from the genset. My question is, if the ground wire and the white wires must be separate and not together, I think that I have understood that the ground wire would be grounded to the boat from the panel box, thus making the water the ground, then does the neutral connect to boat as a ground or is it just connected in the panel box neutral side, and separate from all other connections? I know this is hard to understand, I have tried to word it the best I can to give you an idea on what I have got going! And also the genset only have 3 wires coming out of it, two leads (Hots), which is 110 each and a bare copper ground wire. I own a 29' Chris Craft houseboat. I have redone the grounding system as follows. Fasten a #6 Copper wire to a thru-hull anode, and take it to a distribution board. To this board I attached sub boards for varioius circuits using a #10 Cu wire. All connections are soldered with shrink wrap, and the ends covered with liquid electrical tape. 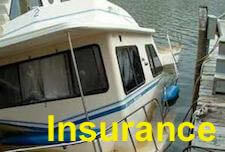 I have 2 "House Boats" but I think they are unlike most written about on these pages. They are actually stick built cabins with logs for flotation. They are moored in a lake, but not at a commercial moorage and they do not have commercial shore power available. We legally do not have privilege to use the adjoining shore. One scenario is wood frame structure with metal roof. Solar electric panels mounted on aluminum frame fastened to the metal roof. A 400ah battery bank supplies 12vdc lighting and 12VDC outlets. A 2000 watt Xantrex inverter/charger supples 110VAC plug circuits when either the inverter is on or the portable generator is plugged into the system and running, in which case the inverter charger transfer to the generator-charger and the plug load is supplied by the gen set. Question, the systems are not "grounded", should they be and if so how. Just starting such a project myself and find it extremely difficult to locate example schematics and drawings of the correct wiring. There seems to not be a standard. No authority on inverters, converters, switches, gauges, equipment, safety equipment, etc... RV and Marine industry similar, but decades apart in consistency.